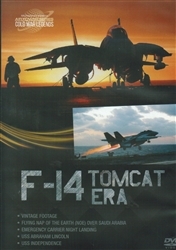 F-14 Tomcat Era Fighter DVD. The F-14 Tomcat was the world's premiere air defense to air superiority fighter capable of diverse roles for air-to-air combat! Unmatched in aerial warfare ranging from forward air control to reconnaissance... and from close air support to precision deep-strike, it was no wonder that the F-14 became CENTCOM's platform of choice all over the world especially in Afghanistan and Iraq! Run time is about 51 minutes. Format is NTSC DVD and region-free.